Life stories in the classroom, and beyond! Everyone has a story and I am no exception. History teacher, father, wanderer, dreamer, collector of ideas — a story seemingly made up of events sewn into a social-web patchwork quilt, the edges occasionally frayed and torn. But this year, for a workshop I recently gave at QPAT, I had to temporarily shelve my experiences and learn to listen. The myriad oral history resources coming out of the CURA Life Stories Project seemed overwhelming. 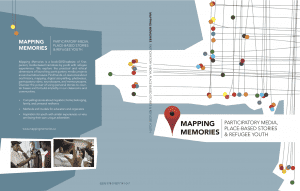 Over 500 new Montrealers were interviewed during this five year project, all of them witnesses of mass atrocities, genocides, all people who had lived unwanted and forced displacements. A workshop about hearing their stories and listening to their voices couldn’t simply be about how events fit into our provincial curriculum, though that somehow had to be part of it. It needed to cover the whole process and experience. It had to bring it all into the classroom, yes, but more than that, it needed to go beyond. I started as I often tend to do with form. What was their procedure, around the microphone, and what shape did it take? Oral history had always fascinated me – the legends of First Nations transmitted down through time, personal accounts from the Great War, those who lived through Katrina and shared their views by the thousands. Why, I asked myself, were the techniques surrounding these oral histories not found in our history programs, in an age when the listening and recording technologies are literally in our pockets? The CURA Life Stories Project had a methodology to share. “A life story interview includes the ‘before’ and the ‘after’ of significant events in someone’s life, and this approach finds meaning in the context of a life lived rather than focusing on a traumatic moment or turning point,” says Steve High the project’s coordinator, and this implies recognizing a much longer personal history and a much deeper communication process. (Many interviews lasted several hours!) Also, given the personal nature of the subject matter, a well-defined ethical commitment was essential. “Around the microphone” now meant in front of the camera, documenting the silences, the memories, and doing it all in respectful way. The Life Stories site includes an “Ethics Guide” that describes ways to… mitigate harm caused by the recollection process, ways to obtain informed consent, considers the participants’ rights and options throughout the interview process, and outlines the researcher’s responsibility concerning matters of confidentiality. Similarly, the particular methods used to record and edit the interviews are documented in the form of oral history training and video guides equally useful for teachers and students. But what of the historical events, the horrible atrocities described, where would they all fit “in the classroom?” The Life Stories project brought together several working groups who collected testimonies from Rwandans, Cambodians, Haitians as well as from Holocaust survivors. These were real stories, disturbing and often quite unfamiliar to our students. I asked those present how their students might react, and many said that students typically responded quite well, that they often rose to the occasion and recognized not only the horrors but also the strengths and hopes of the survivors. We watched sections from Life in an Open Prison, an example of the way students in Megan Webster’s class at St. Georges School reacted, not by simply understanding but by doing, by actually finding and interviewing witnesses themselves. How else to bring these stories into their classrooms? We then found connections to the Contemporary World program, to the Ethics and Religious Cultures program, and even to subjects such as FSL and ELA. 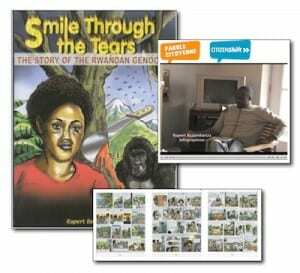 We toured new Learning Situations, including mine on Rwanda and graphic novelist Rupert Banzambana, and others that the Education Working Group will be presenting in March. Other connections, via the Broad Areas of Learning were suggested, via the more obvious Citizenship focus, but also through Media Studies, through reflections on the role of television and newspapers in the conflicts in question. This allowed a segue into the present day, to focus on the the lives of youth in Montreal, recently recorded, who also had stories to share. Part three of the workshop explored how to go “beyond the classroom.” For this section I welcomed Michele Luchs, an active member of the Life Stories Refugee Youth working group. She helped us all tour the group’s new website and book called Mapping Memories. A truly inspiring site, their “projects” not only included interviews their team conducted, but also consisted of training for young refugees so they could learn to interview each other. 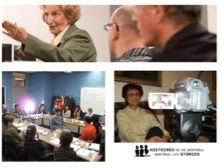 As with the main Life Stories project, this group produced many usable video resources, but also a wealth of guides and activity suggestions, how to tell a digital story, how to “go public” on an issue, and more. Theirs was a process that went beyond the classroom and into the community, an oral history methodology that recognized the importance of where the story was being told. Right through school walls. In the end I knew oral history was more than just another type of document to explore. Life stories could connect students to the world, to each other, they could reach out to youth in our communities and bring those communities back into the school. But even more than that, they could help to bring about significant and necessary change…. I recalled another presentation: It was a panel discussion I participated in over a year ago, one that included Romeo Dallaire himself. We were there to critique and help launch the book put out by the “Will to Intervene” project. Full of detailed stories and contexts for the particular events surrounding the Rwandan genocide and others, the book also outlined concrete plans for how to prevent these atrocities from happening in the future. One guiding premise was that educators and other public groups had an important role to play. Students too. Going beyond the classroom now meant saving real lives, responding effectively against atrocities, averting physical and cultural loss. Memories, recorded, understood, repeated, these stories were now more concerned with the future than ever before. What do you think? Is it possible for students to learn to listen this well? Can students help make a difference to someone’s future? Does this fit, in or out of your classroom? A couple weeks ago, I ran across a former student of mine who immediately recognized me and asked if I remembered her. When she gave me her name, I did recall this frail little person in one of my Masters of Literature class many, many years ago. She went on to embarrass me and tell me how my passion for literature changed her life. She is now a social worker doing amazing things with children from broken homes and abusive situations. She told me how one particular poem from a group of Metaphysical poets from the 17th century had sensitized her to the suffering of others, and that from moment on she wanted to make a difference in the world. In answer to Paul’s question, the answer is certainly Yes, however, it must start with educators who bring passion and commitment to the classroom. The stories they tell must resonate on many levels both for themselves and their students. If it does not, the exercise becomes hollow and meaningless. The oral histories described by Paul touch their audiences because of the depth from which they emerge, and the dreams to which they direct us all. Agreed. I would only add that sometimes that depth and those dreams can come from the guests that teachers invite into the class, in person or by virtue of recordings. Sometimes teachers too can join their students on that journey, in that process of inspiration. Paul, this is so inspiring. I think this kind of activity is the best possible example of education that matters, that actually has an immediate use. I have often thought about the fact that in my lifetime, the last surviving WW2 veteran will die, and then there will be no one left to give firsthand accounts. I love how you found connections to different courses. The fact that I can’t think of how to fit it into math, or of any equally compelling activity for students that uses the math program for that matter, makes me suspect the program is not relevant to today’s student. I hope I’m wrong about that. I often question the relevancy of our programs for today’s students. Usually I end up wanting to throw out programs altogether, to teach students to be historians rather than history majors, or to teach them to be mathematicians rather than just students of math, so maybe I am not the best one to ask! But every event had people who “worked” in their respective trades during those events. Imagining how math made a difference might be a starting point as concerns these events at least. Another plan might be to use the process of interviewing to find out how math impacts on youth today. What is key here for me is real people, real life and real students being involved. I like the idea of somehow preserving those views too. As you say, soon all the witnesses will be gone. A powerful post. One thing that becomes apparent is that when we pigeon hole topics into specific subject areas we fail to show students how they really jigsaw together. Being a historian means being a powerful analyst and communicator. Learning to be a good communicator is certainly part of FLS or ELA. And learning from the experiences of others certainly has ties to ethics. We have to expose our students to these stories and to help our students share stories with others. It is through story we learn, we teach and we remember and, hopefully, we make a difference to others.